There’s something about the Fair at night with the rides lit up, in motion, spinning high up into the air. The sounds are different too. We can hear familiar sounds around each corner like the unmistakeable clicking of the posts on the Crown and Anchor wheel, fast in the beginning of the spin and slowing down bit by bit until it stops clicking altogether and the carnival worker sweeps up the quarters we’ve placed so carefully for our bet. The food even smells better at night – the hot dogs, the popcorn, the sweet scent of the cotton candy billowing and spinning around the cardboard stick. The tiny tom donuts bubble away in the cooker and then get rolled into the sweet powdery icing sugar, still hot from the deep fryer. Our skills seem sharper at night too, or so we think. We throw some darts at balloons and win a small stuffed dog and we carry him proudly around the fairgrounds, pleased that we’ve still ‘got it’. Our attempts at throwing a ring around the bottle necks isn’t as successful so we continue down the midway path, each turn a feast of colour for our eyes. We hear music in the distance and begin to move toward it, bombarded with the sights, sounds, smells and colours. The countdown to the Perth Fair is on! 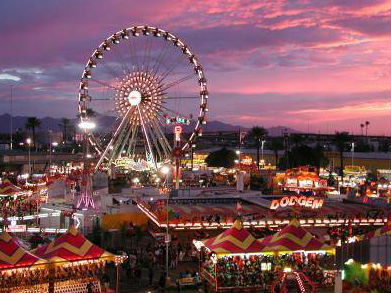 ← Just One Week until the Perth Fair!